Gambrel Barn has the most beautiful room for a bride to get dressed in for the wedding day. It is complete with vintage furniture, large mirrors, elegant light fixtures, and beautiful light for a photographer. On this particular wedding day, it was rainy, cloudy and the chance of an ice storm was high enough to put everyone's emotions into overdrive! Despite the weather, my bride was just happy to be marrying her groom. She had all of her bridesmaids in this gorgeous dressing room, where there were giggles and laughter. I asked her to look towards the window and think about the moment where she finally got to see her groom. She broke out in a giggle and crinkled her nose. I love the genuine look of excitement on her face. 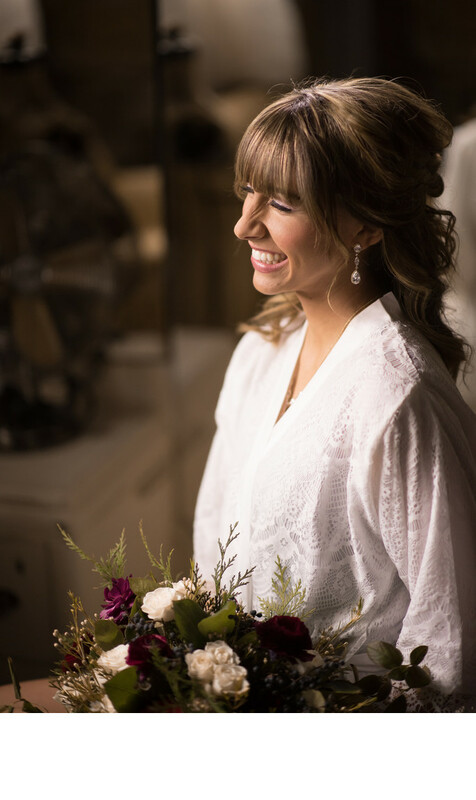 She wore a robe with delicate lace and held onto her bouquet from a very talented Springfield florist.